In light of the weekend’s Reclaim Australia rallies, Senator Lee Rhiannon tells the sad story of refugee Fazel Chegeni, a victim of our detention system. 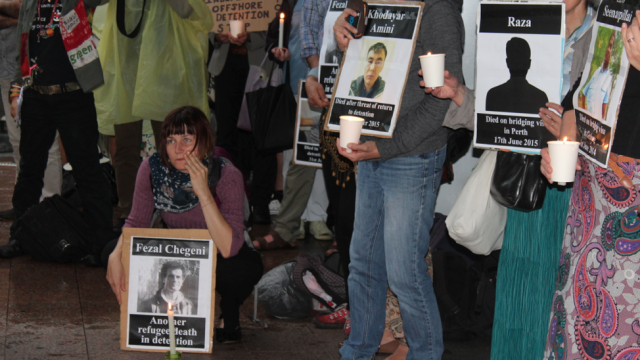 A little over a week ago I spoke at a vigil for Fazel Chegeni, the Kurdish-Iranian man who recently died on Christmas Island. Despite the pouring rain, a strong crowd gathered outside the Department of Immigration’s Sydney offices to pay their respects to Fazel. The ugly politics Reclaim Australia engaged in over the weekend turned my thoughts to Fazel and many other refugees and asylum seekers in Australia. Racist politics wound the whole nation, but on the front line are people like Fazel, who we should be helping to overcome the trauma and hardship they have suffered. Fazel’s death is not an anomaly. It is not a failure of Australia’s detention system. It is the system itself which is flawed, and was flawed from the beginning. Torture, trauma, abuse, mental illness and sexual assault are a direct consequence of Australia’s detention machinery. Successive Australian governments have looked at refugees like Fazel, people fleeing torture, abuse and conflict overseas at the hands of brutal regimes, and delivered them to a brutal system here. Fazel sought our protection in 2011 after escaping persecution at the hands of ruthless Iranian authorities. As a stateless Faili Kurd in Iran, Fazel suffered extreme stigmatisation and cruelty. In his early twenties, he was stabbed at a family wedding, but his wounds were never properly stitched because he was forbidden from accessing hospitals. He was arrested and remanded in Kahrizak Prison in southern Tehran, where he was abused and tortured for forty days. Between the time of his arrival in Australia and his death earlier this month, Fazel was detained in the WA Curtin Detention Centre, the Darwin Wickham Point Detention Centre and Christmas Island Detention Centre. He was in detention for a total of four years. Five immigration ministers came and went. Between March 2012 and September 2015, medical professionals repeatedly warned that detention was inappropriate for Fazel. Those warnings were ignored. Fazel was confirmed to be a refugee but was held in Curtin Detention Centre for security checks while he awaited a visa. One day in 2011 a fight broke out at the detention centre’s canteen. No one was seriously or permanently injured. There was no property damage. It was all over in less than a minute. But over a year later, Fazel and four others were charged with assault. This meant that Fazel was denied permanent residency and would never be allowed to settle in Australia. His lawyers appealed against the sentence and it was overturned, but his initial conviction remained. He was held in custody in Melbourne and moved to Curtin Detention Centre earlier this year where his mental health rapidly deteriorated. Against the advice of Fazel’s torture and trauma counsellor, Immigration Minister Scott Morrison revoked his community detention in December 2013. He was returned to detention and his mental health further deteriorated. He stopped eating and didn’t speak very much. He felt a deep sense of hopelessness. Fazel died three Sundays ago. He was found lying at the bottom of a cliff face, after having escaped from North West Point detention centre on Christmas Island two days prior. A photo of Fazel was supplied to the media after his death. You may have seen it. It is of Fazel in a Melbourne Savers op-shop, trying on clothes. It was taken during his brief period living in the community. During this period, Fazel would ride his bike around the suburbs of Melbourne. He would walk his friend’s dog. A caseworker reported that his self-harming had stopped. But to our shame those moments did not become Fazel’s new life in Australia. While undergoing specialist trauma and torture counselling, Fazel remarked, “I thought it was only in Iran that injustices were done.” We should not forget his words. We should be standing together to welcome refugees and asylum seekers, and offer them the protection and support that they need and deserve. Lee Rhiannon is a senator for New South Wales, elected at the 2010 federal election, representing the Australian Greens.